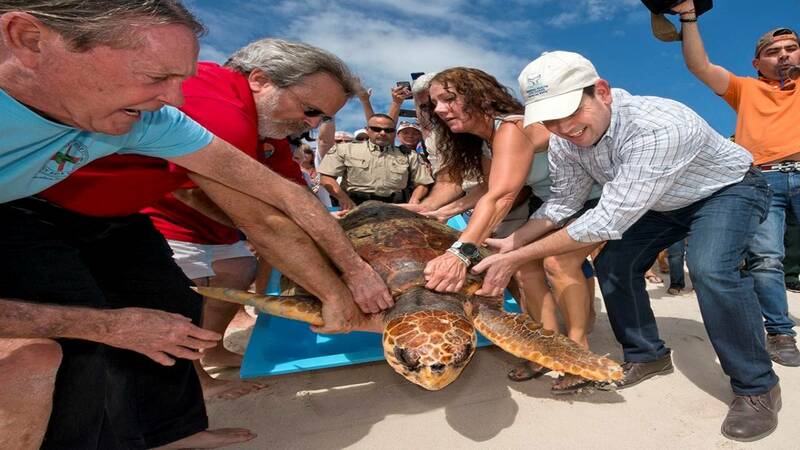 MARATHON, Fla. - U.S. Sen. Marco Rubio, R-Fla., was there Friday as a rehabilitated sea turtle was released back into the ocean Friday off the Florida Keys. The 170-pound loggerhead sea turtle named Lady Bradley was treated by animal care specialists from the Marathon-based Turtle Hospital after it was found in November entangled in crab trap lines off the Upper Keys. "The crab traps that are out in the water -- they see those crab traps and they kinda look at them like free buffets," Turtle educator Melissa Goldblatt said. "She had gotten very tightly entangled in a crab trap rope." Several hundred people gathered on the beach to watch Lady Bradley return home. "It's a once in a lifetime opportunity," Kimberly Sweet, of Michigan, said. "I can't stop crying. Oh my God. It's wonderful." According to the Florida Keys News Bureau, veterinarians had to amputate one of the sea turtle's rear flippers. The turtle's other treatments included laser therapy, broad-spectrum antibiotics, vitamins and a healthy diet of fish and squid. "This kind of work they do here, I mean, it's just a treasure to the community, and they deserve all the credit along with the community that supports them," Rubio told the Florida Keys News Bureau. "It's just exciting to see something like this happen." Lady Bradley seemed to stop and pose for pictures before swimming out to sea. "We know she can find her food and get to her food," said Richie Moretti, of the Turtle Hospital. "We're getting close to mating season. She's a female, so she'll be out there looking for a boy, and two weeks later on the beach having eggs." The Turtle Hospital opened more than 30 years ago and has since treated and rehabilitated nearly 2,000 injured sea turtles.